Ok this is going to sound crazy but here we go! 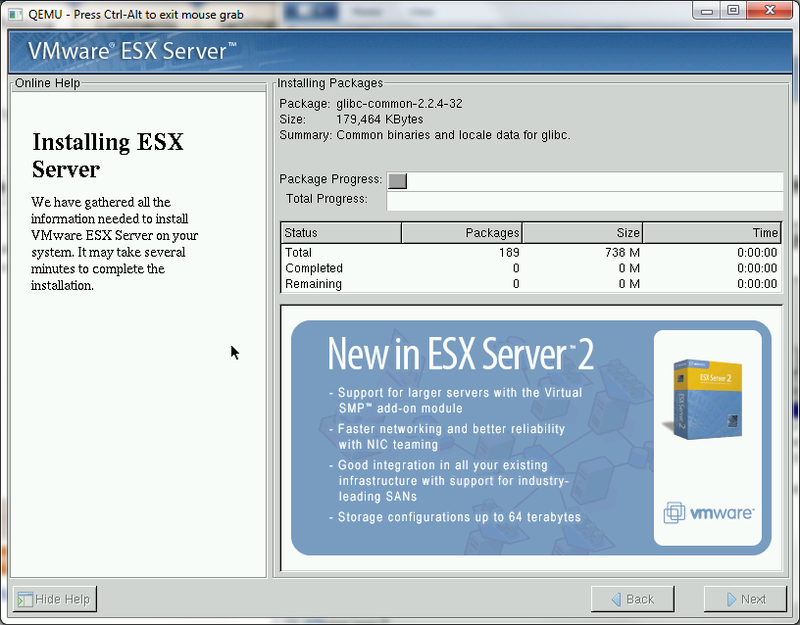 Today I’m migrating this old SQL 7/Windows 2000 database server from VMWare ESX 3.5 to Proxmox VE. 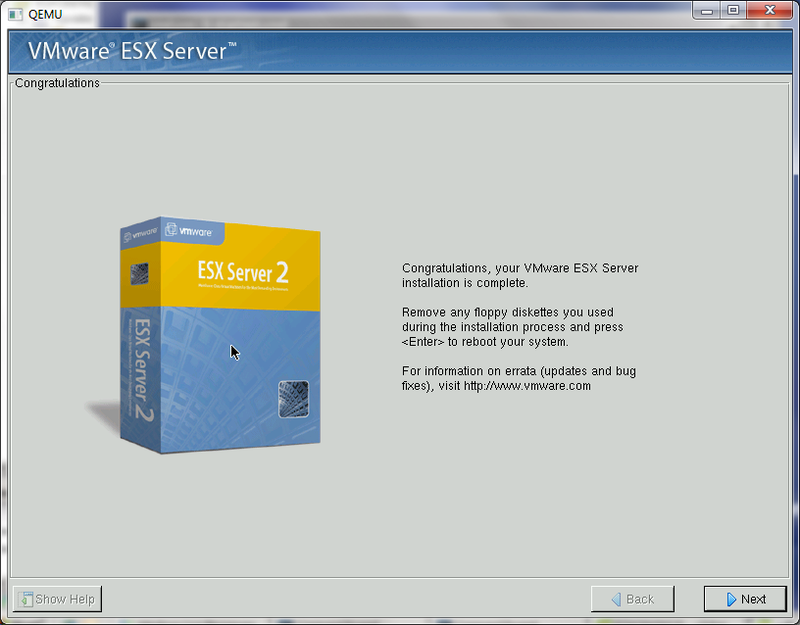 However this server started out on a VMWare ESX 2.5 server. And in the subsequent years had been decommissioned , and never updated but rather just copied onto the 3.5 cluster as we decommissioned the 2.5 cluster.  At least I figured disk space was cheap enough we should keep the old VMs that “we will never need again” because.. Eventually someone will panic, and realize they need it again. In the first step of doing so I needed to remove the old version of VMWare tools. But the catch is, this old version requires you to have the msi package handy to remove it. Well isn’t that a fun little catch. And you’ll find all kinds of ideas on what to do now that you don’t have your original “VMWare Tools.msi”. And more importantly you’ll now realize that you should have not only saved your old ISOs of ESX, but you should have also pulled out the tools ISOs and saved them as well. Luckily I did save the software keys thought! 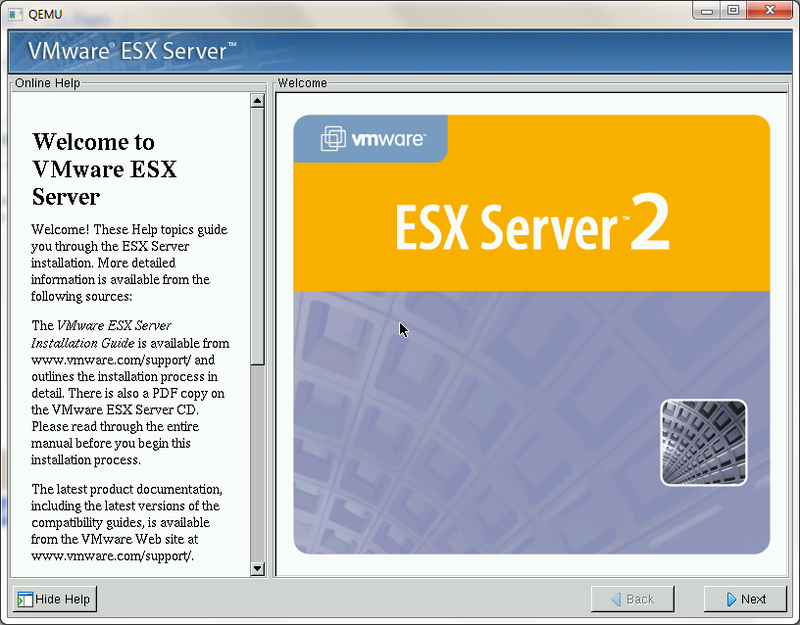 Although I suspect that is also somewhere on their website, but they make it a chore to find the old stuff.. At any rate with 30 minutes of searching I finally came across the last version of 2.5, ESX Server 2.5.5 Build 57619. Now it would seem that the VMWare tools are kept in an RPM file. Which is going to be a major pita for me to extract on Windows so I decided to take the more insane route, and install ESX on Qemu! 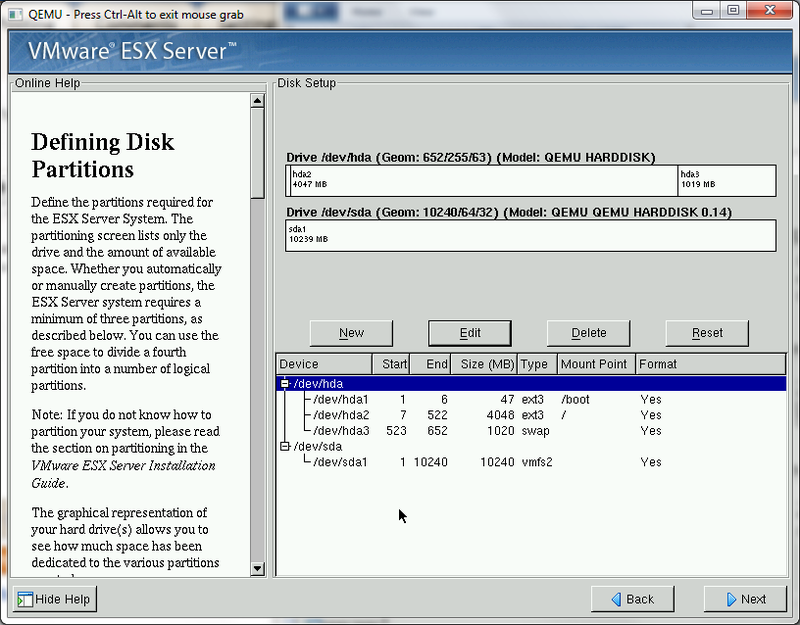 First I create a 5GB IDE disk to boot VMWare ESX server off, and a 10GB SCSI disk for the vmfs. This pulls in a few things, the SCSI configuration along with the AMD CPU type configuration that I’ve touched on previously. And Qemu should easily boot the graphical installer. And when it comes to the partitioning, I simply extended the root partition to the rest of the drive, and setup vmfs2 on the SCSI disk. I’m not even thinking about clustering, I’m primarily after the extensions. Installation takes about 20 minutes. It is just the way it is. 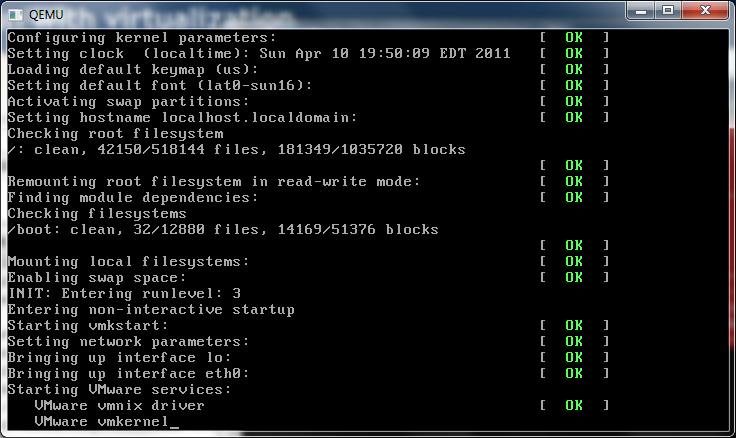 The pegasus cimom for linux takes forever, along with the provider-esx package. I have no idea why, it’s probably thousands of little files or something crazy like that. But be patient, it’ll install. And there we go, a successful installation! 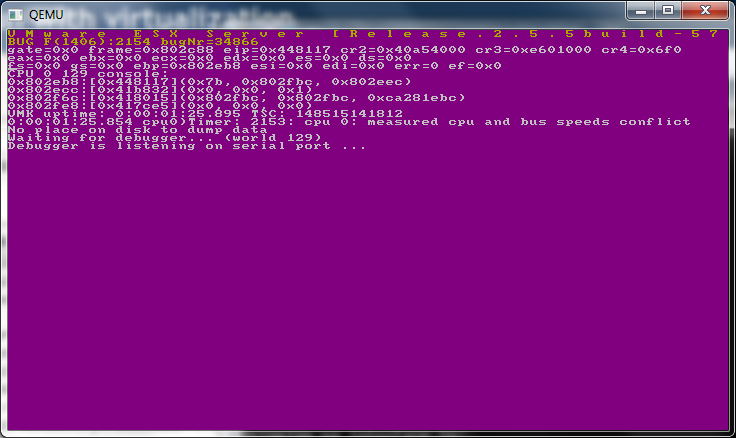 Now VMWare will want to reboot, I just kill Qemu, and then launch it booting off the IDE harddisk (-boot c). 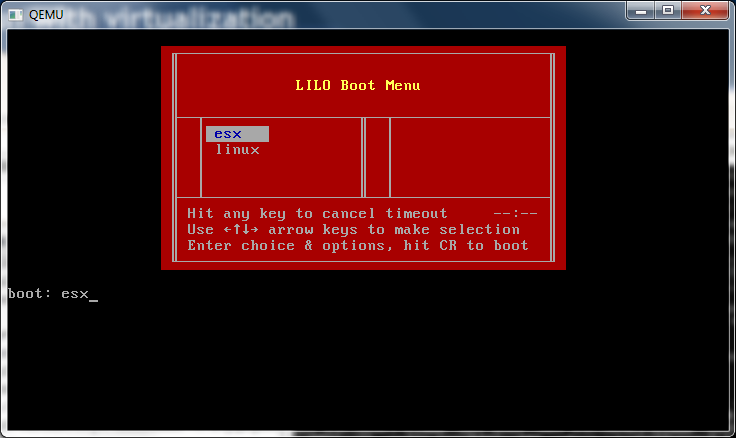 Now we get an ESX and Linux boot menu. 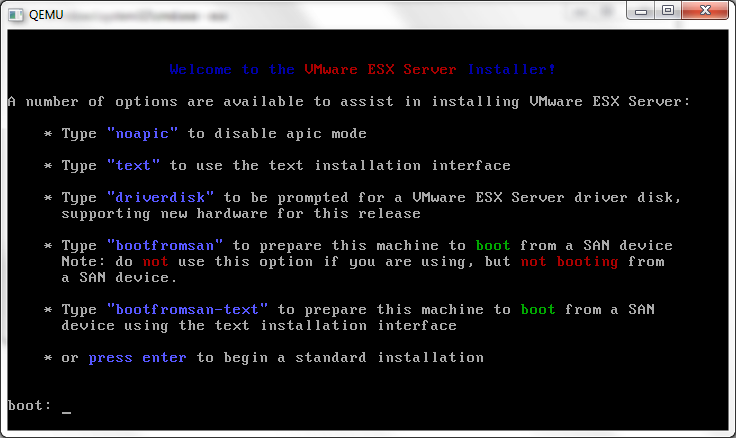 I’m feeling brave, so let’s try to boot ESX! Oh well. But we can boot into Linux, and scp out the extensions! Which do hide in /usr/lib/vmware/isoimages/windows.iso . So it’s not a total loss. 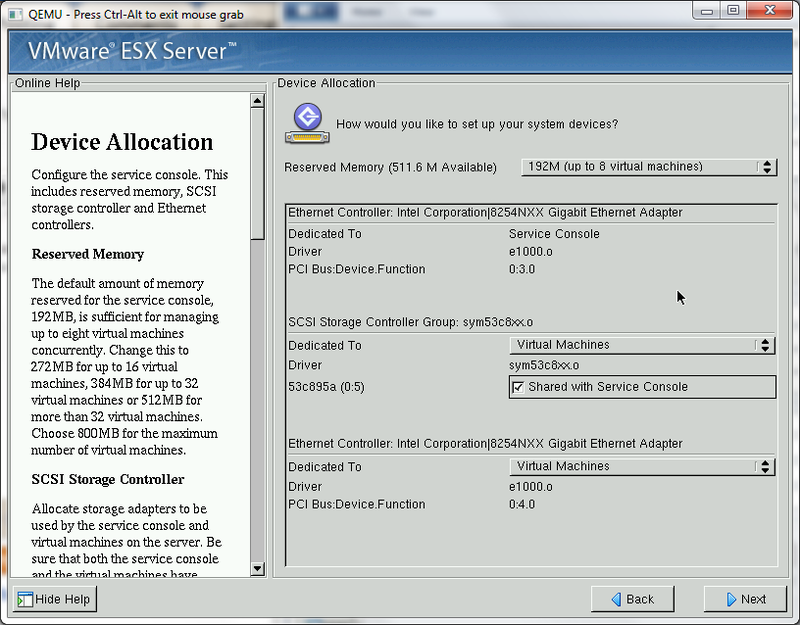 I did notice on VMWare Fusion there was a setting for ESX, perhaps I can run ESX 2.5.5 on my Mac? Perhaps, but I’ll try that for later. The file VMWare Tools.msi is not a valid installation package for the product VMware Tools. Try to find the installation package ‘VMware Tools.msi’ in a folder from which you can install VMware Tools. However the ISO did offer a chance to ‘upgrade’ my apparently older 2.5 extensions. So I did that, rebooted, then with a matching level ISO I was able to remove them. Wow was that convoluted! If anything I guess we’ve found out you want to hold onto these extension CD’s not matter what.. You never know if someone comes in with an old VM, or if you had a decommissioned VM that suddenly has to be brought back to life, it’s best to have these handy to get them back into shape. Just because your setup is all ‘complete’ it doesn’t stop people from throwing you curve balls. Regarding opening RPM files on Windows: 7-zip should be able to do it (you'll see a cpio archive inside, and you can open that cpio in 7-zip as well). Thanks… Although the next fun thing is dealing with CPIO stuff on Windows… Plus it's also interesting to see how far ESX can go on Qemu. 7-zip handles cpio just fine – you just have to navigate through the directory hierarchy. Do you still have the esx-2.5.5-57619.iso in your personal archives? Do you think you can share it somewhere, or I give you access to ftp? I need 2.5 for some really old machines that can’t run 3.0. I don’t need any licenses, I still got them from years ago. Linux 0.00 & 0.11 on Qemu!